At that time there was a monk of the Western Region named Bodhidharma, a Persian Central Asian. [note 5] He traveled from the wild borderlands to China. Seeing the golden disks on the pole on top of Yǒngníng's stupa reflecting in the sun, the rays of light illuminating the surface of the clouds, the jewel-bells on the stupa blowing in the wind, the echoes reverberating beyond the heavens, he sang its praises. He exclaimed: "Truly this is the work of spirits." He said: "I am 150 years old, and I have passed through numerous countries. There is virtually no country I have not visited. Even the distant Buddha-realms lack this." He chanted homage and placed his palms together in salutation for days on end. Firstly, Daoxuan adds more detail concerning Bodhidharma's origins, writing that he was of "South Indian Brahman stock" (南天竺婆羅門種 nán tiānzhú póluómén zhŏng). Secondly, more detail is provided concerning Bodhidharma's journeys. Tanlin's original is imprecise about Bodhidharma's travels, saying only that he "crossed distant mountains and seas" before arriving in Wei. Daoxuan's account, however, implies "a specific itinerary": "He first arrived at Nan-yüeh during the Sung period. From there he turned north and came to the Kingdom of Wei" This implies that Bodhidharma had travelled to China by sea and that he had crossed over the Yangtze. Thirdly, Daoxuan suggests a date for Bodhidharma's arrival in China. He writes that Bodhidharma makes landfall in the time of the Song, thus making his arrival no later than the time of the Song's fall to the Southern Qi in 479. Finally, Daoxuan provides information concerning Bodhidharma's death. Bodhidharma, he writes, died at the banks of the Luo River, where he was interred by his disciple Dazu Huike, possibly in a cave. According to Daoxuan's chronology, Bodhidharma's death must have occurred prior to 534, the date of the Northern Wei's fall, because Dazu Huike subsequently leaves Luoyang for Ye. Furthermore, citing the shore of the Luo River as the place of death might possibly suggest that Bodhidharma died in the mass executions at Heyin (河陰) in 528. Supporting this possibility is a report in the Chinese Buddhist canon stating that a Buddhist monk was among the victims at Héyīn. Bodhidharma, stone carving in Shaolin Temple. In the Anthology of the Patriarchal Hall (祖堂集 Zǔtángjí) of 952, the elements of the traditional Bodhidharma story are in place. 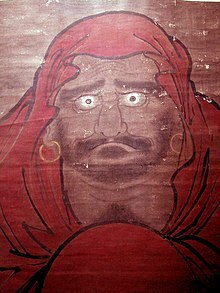 Bodhidharma is said to have been a disciple of Prajñātāra, thus establishing the latter as the 27th patriarch in India. After a three-year journey, Bodhidharma reached China in 527, during the Liang (as opposed to the Song in Daoxuan's text). The Anthology of the Patriarchal Hall includes Bodhidharma's encounter with Emperor Wu of Liang, which was first recorded around 758 in the appendix to a text by Shenhui (神會), a disciple of Huineng. Subsequent to the Anthology of the Patriarchal Hall, the only dated addition to the biography of Bodhidharma is in the Jingde Records of the Transmission of the Lamp (景德傳燈錄 Jĭngdé chuándēng lù, published 1004 CE), by Dàoyuán (道原), in which it is stated that Bodhidharma's original name had been Bodhitāra but was changed by his master Prajñātāra. The same account is given by the Japanese master Keizan's 13th-century work of the same title. The nun Zong Chi[note 7][note 8] stepped up and said, "It is like a glorious glimpse of the realm of Akshobhya Buddha. Seen once, it need not be seen again." Tanlin, in the preface to Two Entrances and Four Acts, and Daoxuan, in the Further Biographies of Eminent Monks, mention a practice of Bodhidharma's termed "wall-gazing" (壁觀 bìguān). Both Tanlin[note 9] and Daoxuan[web 5] associate this "wall-gazing" with "quieting [the] mind" (Chinese: 安心; pinyin: ānxīn). In the context of the Indian caste system the mention of "Brahman king" acquires a nuance. Broughton notes that "king" implies that Bodhidharma was of a member of the royal caste, an khyastha caste of warriors and rulers. Brahman is, in western contexts, easily understood as Brahmana or Brahmin, which means priest. Traditionally Bodhidharma is credited as founder of the martial arts at the Shaolin Temple. However, martial arts historians have shown this legend stems from a 17th-century qigong manual known as the Yijin Jing. The preface of this work says that Bodhidharma left behind the Yi Jin Jing, from which the monks obtained the fighting skills which made them gain some fame. Daoxuan's Further Biographies of Eminent Monks (7th century CE). ^ a b See also South India, Dravidian peoples, Tamil people and Tamil nationalism for backgrounds on the Tamil identity. ^ Bodhidharma's first language was likely one of the many Eastern Iranian languages (such as Sogdian or Bactrian), that were commonly spoken in most of Central Asia during his lifetime and, in using the more specific term "Persian", Xuànzhī likely erred. As Jorgensen has pointed out, the Sassanian realm contemporary to Bodhidharma was not Buddhist. Johnston supposes that Yáng Xuànzhī mistook the name of the south-Indian Pallava dynasty for the name of the Sassanian Pahlavi dynasty; however, Persian Buddhists did exist within the Sassanian realm, particularly in the formerly Greco-Buddhist east, see Persian Buddhism. ^ Daoxuan records that Huìkě's arm was cut off by bandits. ^  translates 壁觀 as "wall-examining". ^  offers a more literal rendering of the key phrase 凝住壁觀 (níngzhù bìguān) as "[who] in a coagulated state abides in wall-examining". ^ viz.,  where a Tibetan Buddhist interpretation of "wall-gazing" as being akin to Dzogchen is offered. ^ This argument is summarized by modern historian Lin Boyuan in his Zhongguo wushu shi: "As for the "Yi Jin Jing" (Muscle Change Classic), a spurious text attributed to Bodhidharma and included in the legend of his transmitting martial arts at the temple, it was written in the Ming dynasty, in 1624, by the Daoist priest Zining of Mt. Tiantai, and falsely attributed to Bodhidharma. Forged prefaces, attributed to the Tang general Li Jing and the Southern Song general Niu Gao were written. They say that, after Bodhidharma faced the wall for nine years at Shaolin temple, he left behind an iron chest; when the monks opened this chest they found the two books "Xi Sui Jing" (Marrow Washing Classic) and "Yi Jin Jing" within. The first book was taken by his disciple Huike, and disappeared; as for the second, "the monks selfishly coveted it, practicing the skills therein, falling into heterodox ways, and losing the correct purpose of cultivating the Real. The Shaolin monks have made some fame for themselves through their fighting skill; this is all due to having obtained this manuscript." Based on this, Bodhidharma was claimed to be the ancestor of Shaolin martial arts. This manuscript is full of errors, absurdities and fantastic claims; it cannot be taken as a legitimate source." ^ Henning: "One of the most recently invented and familiar of the Shaolin historical narratives is a story that claims that the Indian monk Bodhidharma, the supposed founder of Chinese Chan (Zen) Buddhism, introduced boxing into the monastery as a form of exercise around a.d. 525. This story first appeared in a popular novel, The Travels of Lao T’san, published as a series in a literary magazine in 1907. This story was quickly picked up by others and spread rapidly through publication in a popular contemporary boxing manual, Secrets of Shaolin Boxing Methods, and the first Chinese physical culture history published in 1919. As a result, it has enjoyed vast oral circulation and is one of the most "sacred" of the narratives shared within Chinese and Chinese-derived martial arts. That this story is clearly a twentieth-century invention is confirmed by writings going back at least 250 years earlier, which mention both Bodhidharma and martial arts but make no connection between the two. ^ a b c d Dumoulin, Heisig & Knitter 2005, p. 88. ^ a b c d e f Broughton 1999, p. 54–55. ^ a b c d e f Broughton 1999, p. 8. ^ a b c d e McRae 2003, p. 26. ^ a b c d e f Dumoulin, Heisig & Knitter 2005, p. 89. ^ a b c d Dumoulin, Heisig & Knitter 2005, p. 87. ^ a b c d e Kambe & (year unknown). ^ a b c Anand Krishna (2005). Bodhidharma: Kata Awal adalah Kata Akhir (in Indonesian). Gramedia Pustaka Utama. ISBN 9792217711. ^ a b Edou 1996. ^ a b Jorgensen 2000, p. 159. ^ a b c Broughton 1999, p. 9. ^ a b Broughton 1999, p. 56. ^ a b c Broughton 1999, p. 2. ^ a b c Lin 1996, p. 182. ^ a b Maguire 2001, p. 58. ^ a b c d e Lin 1996, p. 183. ^ a b Broughton 1999, p. 62. ^ a b c Garfinkel 2006, p. 186. ^ a b Dumoulin, Heisig & Knitter 2005, p. 96. ^ a b Henning 2001, p. 129. McRae, John R. (2000), "The Antecedents of Encounter Dialogue in Chinese Ch'an Buddhism", in Heine, Steven; Wright, Dale S. (eds. ), The Kōan: Texts and Contexts in Zen Buddhism, Oxford University Press . ^ "The Committee of Western Bhikshunis". thubtenchodron.org. ^ Zen Nun. "WOMEN IN ZEN BUDDHISM: Chinese Bhiksunis in the Ch'an Tradition". geocities.com. Archived from the original on 27 October 2009. ^ Simon Child. "In The Spirit of Chan". Western Chan Fellowship.